One of my favorite fast food sandwiches is the Arby’s Beef ‘N Cheddar. Mmm, with it’s roast beef smothered in a magical golden cheese sauce, and buns topped with tangy Arby’s sauce. It’s a thing of beauty. The problem is that is physically pains me to pay for fast food when I can make something of equal or greater quality and taste at home. My husband, a die-hard Arby’s flavor fanatic, agreed this sandwich is an Arby’s clone. I have a confession to make…I haven’t been completely honest with you. These don’t taste like the Arby’s beef & cheddar sandwiches we all know and love. These taste better!! It’s the same great flavor you love, but without any of the old greasy taste. Also, if you don’t feel like mixing up your own Arby’s sauce, you can sub Catalina dressing. I have it on good authority that that’s actually the secret, much coveted loved, Arby’s sauce. 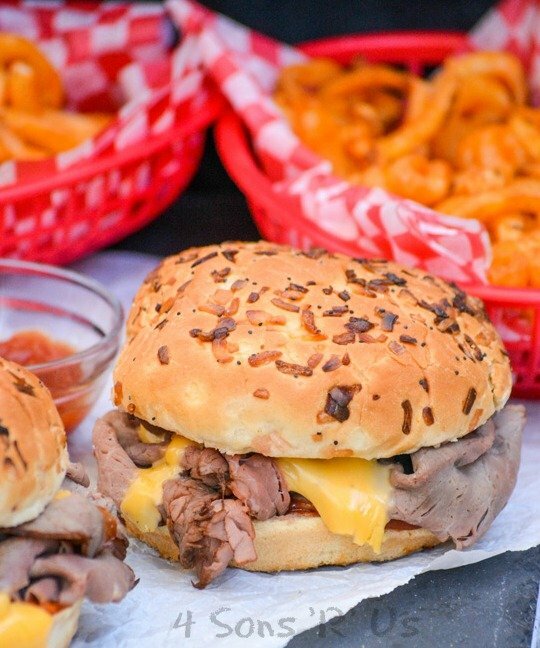 Pony on up to the table, because this Copy Cat Arby’s Beef N’ Cheddar sandwich is where the party is at. 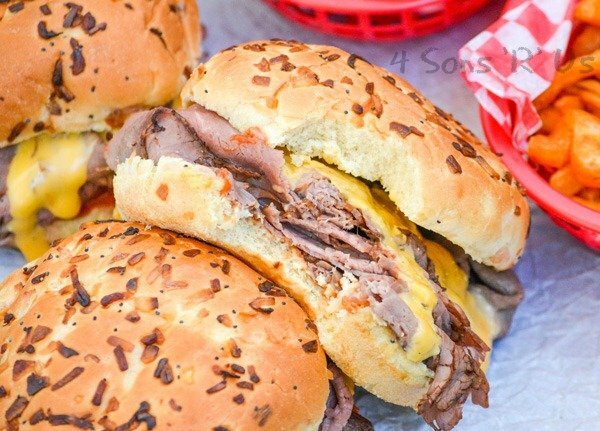 Fluffy onion buns are spread with a robust house sauce, piled high with thinly sliced roast beef, and dripping with an addicting cheese sauce. It is the most spot-on copycat of one of our favorite restaurant sandwiches. You don’t have to get dressed up. Shoot, you don’t even have to put on pants if you don’t want to. 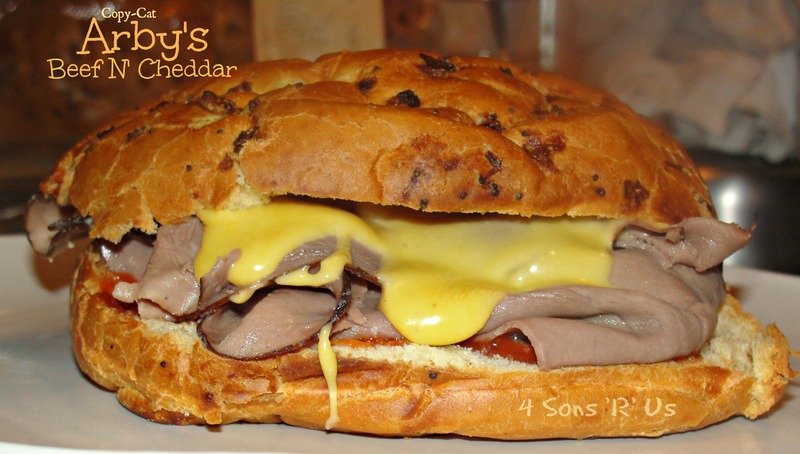 Enjoy your favorite, meaty, cheesy fast food sandwich at home- in a snap. 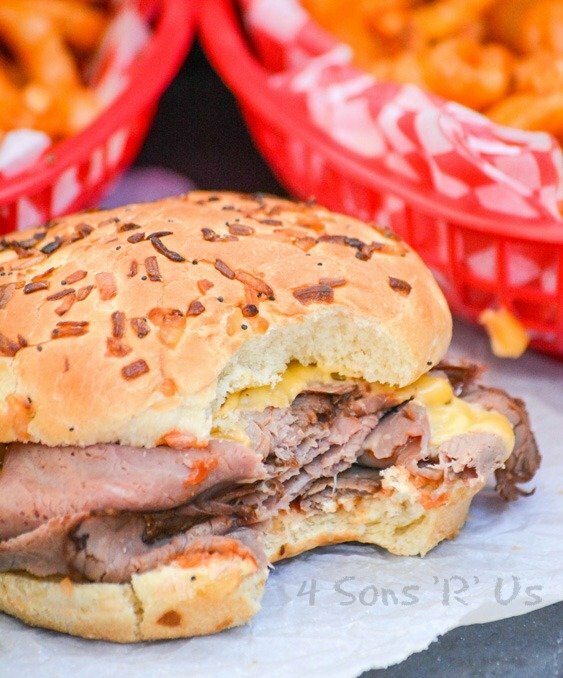 This sandwich is a true copy cat of it's restaurant counter-part, featuring fluffy onion buns piled high with roast beef, slathered in a signature sauce and dripping with golden cheese. Heat a skillet over medium heat. Add the meat and place a lid over the top, and then turn the heat to medium low. Meanwhile, stir together the Arby's sauce ingredients and spread on the buns. In a pot on the stove on medium-low heat, add cheese, milk, garlic powder, and pepper and stir until completely melted and evenly combined. Place the meat on the buns, add the cheese sauce, and a little more Arby's sauce (if desired). Top the sandwiches off with their other half. Serve immediately, with curly fries, for an authentic in-home Arby's experience. Have you tried making your own fast food favorites at home? We’d love to hear about it in the comments below. Made these for supper tonight, very close to tasting like Arby’s! Will definitely make these again. Everyone loved them! Thanks, Linda. I’m so glad you liked them. Do you have a Kroger nearby? That’s where I go. I either get their brand or Boars Head. I also like to get medium so that it doesn’t overcook and turn dry when we make these. This is going on my dinner menu! It’s makes a regular appearance on ours. So easy! My husband would love these! It looks just like Arby’s! Yep, and tastes just as good too. This sounds so good – and it looks better than Arbys! Thanks, Kit! I’ll just say this, it gives the original a run for it’s money for sure. Hi. Looks good. Why American cheese for a Beef ‘n Cheddar though? It melts well and more evenly than cheddar. Let me know if you try it with slices of cheddar though, and how it turns out. I used to work at Arby’s years ago. The red sauce is actually called Red Ranch. Catalina or French dressing are both good substitutes. Arby’s sauce is completely different. It’s more of a tangy BBQ sauce where as the Red Ranch is much sweeter. On a side note, I like to ask for extra Red Ranch and dip my curly fries in it. If you want to get your fry fix and keep it homemade you can get Arby’s brand curly fries at the grocery store. I agree with Queenie. I too worked at Arby’s and the Beef and Cheddar sandwich has Catalina sauce not the Arby’s sauce. I made these for dinner a couple nights ago. I found a different recipe for the sauce that called for Apple cider vinegar, a few drops Tabasco, and brown sugar. Those ingredients gave it more flavor. I was disappointed in the cheese for this, it wasn’t a cheese sauce like I was expecting, I will use a different recipe for the cheese next time. I would also toast the buns, I added a horseradish sauce that was amazing! I’m glad you adapted it to your liking, Crissy! I’ll have to give your version of their sauce a try, and we love them with horseradish sauce. That’s great that you have a version you enjoy. I like ours, but to each their own! You know what I did. I over cooked the roast beef and got it nice and dried out and the bun was actually kind of stale and forgot to put the cheese sauce on and it was actually exactly like my last order at Arby’s so yeah this is really good. Just kidding I actually made this exactly how your recipe was quoted and it was delicious. Pingback: The Best Seinfeld Recipes, Crafts, Printables & More! Have to agree with the post above. I also worked at Arby’s. It’s red ranch and nothing like what your using. Your using Todd Wilber’s recipe for Arby’s sauce he published years ago. A close approximation is the Catalina dressing or the Honey French. 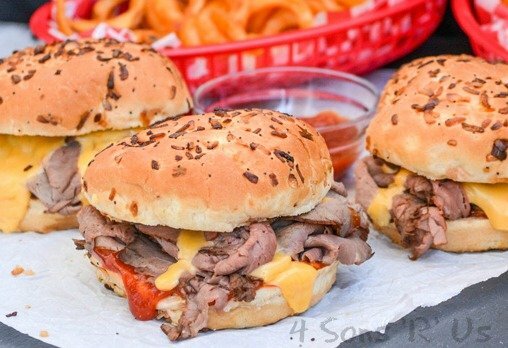 My husband suggested I find a recipe for these, since we had some leftover roast beef from a sub party. We both love beef and cheddar sandwiches, so I thought it was a great idea too. It was!! We just finished eating these and are already looking forward to making them again in the future. Delicious!! The actual Arby’s Beef And Cheddar’s do not use the Arby’s signature sauce. They use a sauce called Red Ranch Sauce. I have searched for that sauce recipes for a long time and have had no luck. The 2 sauces taste vastly different. I don’t even really like the signature sauce. But I love the other Red Ranch Sauce. I am the greatest fan of the beef and cheddar. 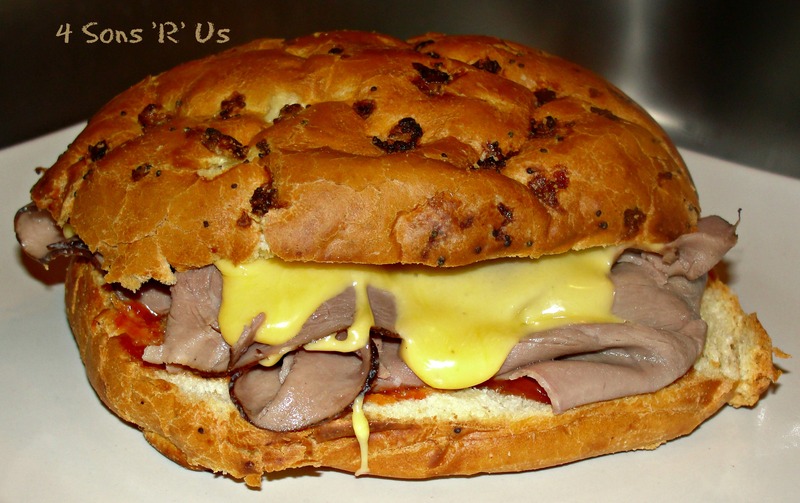 Arbys changed the way the beef and cheddar was made in 1986 and has taken away the process which enriched its flavor. The onion buns were basted in salted butter and sent through a slide toaster. The buns were also a light brioche style onion bun and was switched to a heavier eggflower bun. (I worked there when they changed it) I Your recipe is spot on for the recipe otherwise! Good job! There’s a strand of saliva in one of the bitten sandwiches, awesome pictures, mouth-watering. I am a fan of Arby’s. The sauce on the Beef and Cheddar is more of a Catalina salad dressing. It is not their Arby Sauce which is a BBQ sauce.